According to sci-fi movies made 20 to 30 years ago, we should all be walking into our homes and speaking "lights-on" and "TV-on" commands by now. We're not quite there yet, but home automation has made significant progress over the last few years. Hardware costs have dropped and new wireless protocols offer reliable connections. Home automation ranges from controlling lights, security systems, cameras, window blinds and irrigation to streaming audio/video throughout a house. 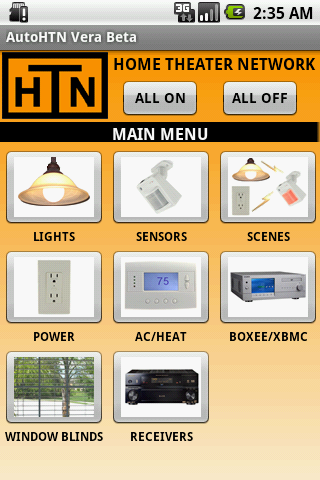 The best way to describe home automation is through examples, and there are a few listed in our AutoHTN section. There are many ways to add home automation to a home theater network. There’s a DIY (Do-It-Yourself) approach where automation protocols such as X10 or Z-Wave are used along with control software on a PC. Another approach is using professional installation which includes home automated hardware and software. If setting up home automation systems sounds too complicated, there is always the professional installation option. 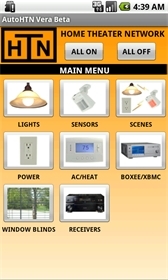 The companies listed below provide home automation products that professional installers use. AMX and Crestron home automation systems are designed for the luxury home market with prices averaging over $60,000. Control4 and HAI can also work in luxury homes, but they have systems available for lower prices. Control4 systems can run in the $10,000 to $20,000 range while HAI systems run under $10,000. The prices are just averages and depend on the extent of home automation desired. Be aware that AMX, Creston and Control4 use proprietary hardware and software solutions that will only work with their respective systems. AMX and Control4 do use the open standard Zigbee, but they are not compatible with other Zigbee devices. Keep this in mind for any future expansion plans. For example, wanting to add a light dimmer to a Control4 network will require the purchase of a Control4 dimmer from a Control4 supplier. HAI works with automation protocols such as UPB, Z-Wave and X10 as long as protocol bridges are added to the network. The first decision in installing a home automation system is if you’re a do-it-yourselfer or to hire a professional installer. The DIY approach can be very satisfying and can save you tons of money; however, the DIY approach could also take lots of time and can be frustrating if commands don’t work. Try to make a list of what you would like automated (lights, video/audio streaming, windows, etc.) Make sure whatever home automation hardware you pick has room for future expandability. If your goal is to only automate some lights, than any of the Z-Wave, Zigbee, UPB, or Insteon protocols should easily be able to accomplish your light switching needs. A receiver for with multiple zone capabilities can be used to distribute audio/video throughout a house. Our AutoHTN works with Mi Casa Verde�s Vera controller.